The Duke and Duchess of Cambridge are incredibly touched that they have received warm hearted good wishes for their young family from all over the world. Prince George was born at 4.24pm on 22nd July 2013 at St Mary's Hospital in Paddington, London. As the first child of The Duke and Duchess of Cambridge he is third in line to the throne, and news of his birth was celebrated the world over. The Duke and Duchess left hospital with their new son on 23rd July. They paused on the steps of the Lindo Wing to allow the world to catch a first glimpse of the new-born prince. The Duke of Cambridge then safely installed his new son into the car seat, before he drove his family home to Kensington Palace. On 24th July, The Duke and Duchess of Cambridge announced that they would name their child George Alexander Louis. He would be formally known as Prince George of Cambridge. Prince George was christened on Wednesday, 23rd October 2013 at The Chapel Royal, St James’s Palace by The Archbishop of Canterbury, the Most Reverend Justin Welby. In keeping with Royal tradition, Prince George wore the hand-made replica of the Royal Christening Robe, made by Angela Kelly, Dressmaker to The Queen. The Lily Font and water from the River Jordan were also used during the baptism. The Duke and Duchess of Cambridge chose the following people to be Godparents to Prince George: Mr Oliver Baker, Mrs David Jardine-Paterson, Earl Grosvenor (Hugh), Mr Jamie Lowther-Pinkerton, The Hon Mrs Michael Samuel, Mrs Michael Tindall and Mr William van Cutsem. In April 2014, Prince George accompanied his parents on their official three week tour of New Zealand and Australia, and received a warm welcome in both countries. The Duke and Duchess of Cambridge have chosen to share a number of photographs of their young family with the public, to mark important milestones. These include Prince George's first birthday, when they released a set of photographs of Prince George enjoying day out with his family at the Natural History Museum. Prince George waves to the public and media as he visits the Lindo Wing at St. Mary's Hospital to meet his little sister for the first time. Prince George became a brother on 2nd May 2015, and he accompanied his Father to St Mary's Hospital to meet his new sister, Princess Charlotte, for the first time. On 6th January 2016 Prince George started at the Westacre Montessori School nursery in Norfolk. To mark the occasion, The Duke and Duchess of Cambridge shared photographs of Prince George standing in front of the mural on the outside of the nursery building. In March 2016, The Duke and Duchess shared photographs from their first holiday as a family of four in the French Alps. It was the first time either of the children had played in the snow. It was very special and fun short holiday for the family. 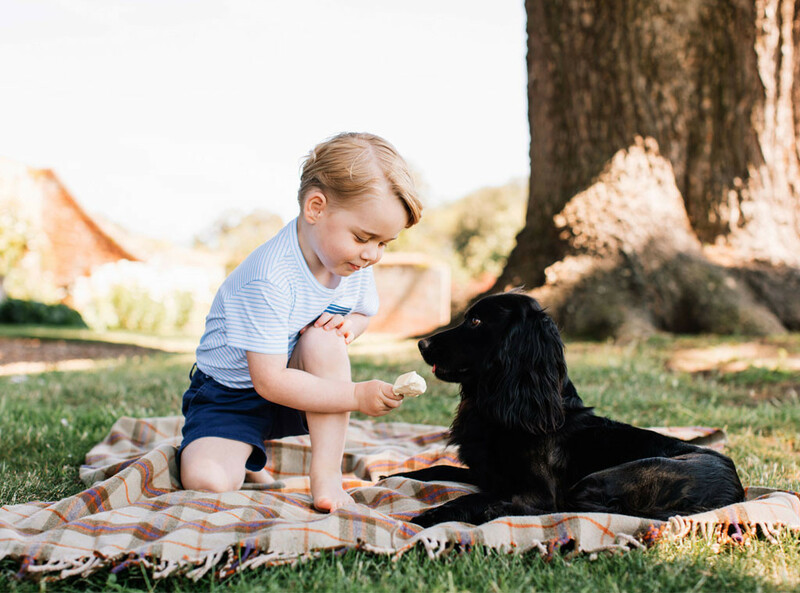 To mark his third birthday, Their Royal Highnesses shared photographs of Prince George taken at their family home in Norfolk, Amner Hall. In September 2016 Prince George, with his sister, accompanied his parents on their official visit to Canada, and in July 2017 they again joined their parents on an official tour to Poland and Germany. To mark his fourth birthday, The Duke and Duchess of Cambridge were delighted to share an official portrait of Prince George taken at Kensington Palace. From September 2017 The Duke and Duchess of Cambridge will send their son, George, to Thomas's Battersea School. Prince George became big brother for the second time on 23 April 2018, following the birth of Prince Louis. The Duke of Cambridge brought Prince George and Princess Charlotte to visit their mother and new brother at the hospital.